Recently, I was shopping at my favorite local discount store and came across yet another new soymilk option which both of my dairy allergic kids love. What is even better is that my daughter, who I have a heck of time getting to drink enough calcium daily, LOVES this stuff! Especially the chocolate flavored soymilk. Sunrich Naturals ORGANIC Chocolate Soymilk, distributed by SunOpta Aseptic, Inc., Alexandria, MN. SunRich Organic Soymilk Review from S.A.F.E. You can also find these products in plain and vanilla flavoring. One week I bought three 8.25 FL OZ individual boxes for a $1.00. That was $8.00 for a case which included twenty-four individual 8.25 FL OZ boxes. I only bought 2 cases. At the same store the next week, I bought six 8.25 FL OZ for the same price. That equaled $4.00 for twenty-four 8.25 individual FL OZ boxes. I bought everything they had left!! I paid almost $22.00 for a case, twenty-seven individual 8 FL OZ boxes, of a more well known brand. You do the math! Unbelievable!! Be sure to visit their webpage to learn more about who they are, their products and their growers. These products are great for school lunches and snack times at school. My son likes them daily, with NO preference as to whether they are room temperature or cold, straight out of the fridge! Here's to a New Year filled with great ideas and alternatives to help us all managing food allergies! 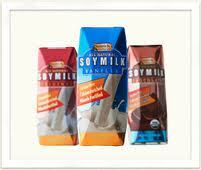 It is great soy milk! But I cannot find any retailers who carry it ( am in Chicago).The company SunOpta seems to sell only to wholesalers or food businesses. If anyone knows where we can purchase this retail, please share. Sorry for this late reply... I can only see it being found in Lomar, Chicago. good luck! I know this was almost 5 years ago, but what store did you find Sunrich at? I've found that soy milk can taste drastically different depending on the brand, and I just found out that daycare will provide Sunrich. I'd like to give my son the same at home. Daycare gets it from a wholesale food service so that's not an option for us. Thanks!